In purchasing equipment for the outdoors, I always use the same thought process. How often am I going to upgrade my equipment based on the new radical improvements that the manufacturer will come out with? How long before my existing equipment will become obsolete and I will have to replace it? How long will it be before I have a disadvantage with my existing equipment? When the time came to choose hiking boots, I decided that I would choose the best hiking boots that I could afford based on the use of the boots. Whatever you decided to buy for hiking, your boots are the most important piece of gear to make your hiking pleasurable. If you have uncomfortable hiking boots that don't rise to the occasion, you will be greatly disappointed. And usually, you will be stuck with those hiking boots until you return from your trip. I was fortunate to bump into a small boot repair shop that was able to stretch my two hiking boots to make a little more room for my little toes. Your hiking boots should be your best friend during your trip. Never purchase your boots without trying them on and never purchase your hiking boots unless you can walk on an incline in the store. Walking on a flat service will not convince you to purchase the boots you are wearing. Be firm on your budget, but also be realistic. You will use your hiking boots for quite a while if you treat them well, so purchase the best boots you can afford. You can always spend a lot more and a lot less. Do you currently have any feet problems - one foot a little bigger than the other, one toe bigger that the same toe on the other foot, feet sweat, pronated ankles, low arches, etc. Everything must be taken into consideration as the wrong boot will accentuate a little problem. Do you get blisters easily? What type of hiking do you plan to be doing? Are you going on day hikes (with or without a backpack)? Are you just hiking with a couple of water bottles using a fanny pack? Are you going out for a few days and will be carrying 40 to 50 pounds? Depending on the type of hiking you will be doing and depending on the conditions will determine the type of hiking boot to choose. Every hiking boot is not for everyone and the most popular and highest rated boot might not be for you. When you try on a pair of boots for the first time, trust how you feel. Don't make excuses in order to choose a particular pair of boots. If they don't feel right the first time you try them on, they are not right for you... no matter how much you want to choose them. Good hiking boots don't have to weigh a lot and don't be confused if the boots are heavy. It doesn't necessarily mean that the boots are a great pair. Many boots are great even though they don't weigh a lot. Always try on new hiking boots wearing the socks that you intend on wearing. Don't use the store socks as a different type of sock will definitely give you a different feeling altogether. The boots should be comfortable, fit securely around your instep and ankle, give you some wiggle room for your toes, but should not slide forward when walking down an incline. Always make sure that the laces are tied correctly and ask the retailer to show you selected tying methods to keep your boot snug. If your heal move away from the back of the boot, the boot might be too wide or the back heal pocket is not deep enough. Are you planning on replacing the current boot foot bed with a more supportive foot bed? If so, you must try the boots on with the new supportive foot bed. There are many types of materials and combinations of materials: leather (numerous kinds), synthetic, leather and material, Gore-Tex, etc. The type of hiking will determine you boot type. Leather boots will take a while to break in, so learn from the retailer which is the best way to break in the hiking boots you decide to choose. There are all different types of tread patterns and each tread is made for a different purpose. Ask the retailer about the tread pattern in the boot that you are about to choose. 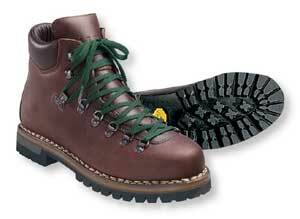 Or choose a particular hiking boot based on the tread pattern that your need. There are a few types of reinforced soles: cemented, stitched, stitched and cemented, etc. Make sure the soles are completely waterproof and can withstand the punishment that you are about to put these hiking boots through. Don't forget to learn how to maintain your hiking boots correctly because incorrect methods might damage your hiking boots and choose hiking boots wisely.